The sleek crisp style of these square recycled plastic trash receptacles make for a good choice to encourage litter-free zones. 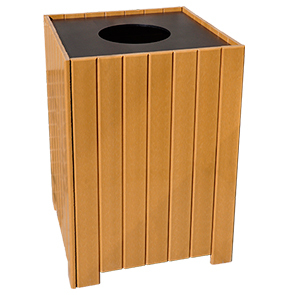 Made with twenty-eight 1" x 4" resinwood slats and a sturdy recycled plastic structure, these trash receptacles are extremely durable. Configured with different lid options, the 20, 32, and 55 gallon capacity trash receptacles are available in an array of resinwood colors. Optional plastic liners are available for the 32 and 55 gallon models.